Description: Z WSPSBD1-24A With BNSF 7515, BNSF 8186, BNSF 4511, & UP 7093 with 34 Loads, 2147 Tons 3221 Feet. Photographed at 10:58. Description: Z WSPSBD1-24A With BNSF 7515, BNSF 8186, BNSF 4511, & UP 7093 with 34 Loads, 2147 Tons 3221 Feet. Photographed at 11:06. Description: Z WSPSBD1-24A With BNSF 7515, BNSF 8186, BNSF 4511, & UP 7093 with 34 Loads, 2147 Tons 3221 Feet. Photographed at 11:13. 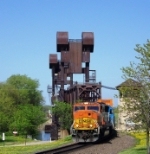 Description: A stack train crosses the St.Croix River. Description: Renumbered to BNSF 1463. Description: L-CHI101 throttles up after stopping at the crossover at Minica. It was great seeing a BN 3-Window SD-60M leading. Description: I know its orange, but it was green at some point. Description: M-GALGAL w/ a great consist! Description: BNSF train V-MCIPTL struts into Stoddard WI following the BRC and ore empties. Who says the line along the Mississippi River is flat? Description: BNSF train V-MCIPTL follows the parade into La Crosse this afternoon. Nice to see these SD60M once again, now to find the SUN!!! Description: Even the engineer takes a moment to look back at his consist and say WOW! Description: Just about every one of BNSF's paint schemes are represented in this shot from 44th Ave. BN Green, H1, H2, H3, Exec, and the ATSF Red and silver. Description: one of my favorite BNSF Photos. #8133 is an SD-60m and is a Bedrock (ballest) train. #8186 is an SD-60M possibly renumbered.